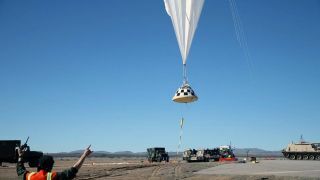 A high-altitude balloon carried a test version of Boeing's CST-100 Starliner for a parachute drop test in February 2017. A commercial spacecraft scheduled to ferry humans to the International Space Station underwent a successful parachute test in New Mexico last month, according to NASA. The test featured a "boilerplate" version of Boeing's CST-100 Starliner, which is one of two vehicles expected to bring astronauts to the station as early as 2018. (You can see a video of the Starliner parachute test here.) The other is a human-rated version of SpaceX's Dragon spacecraft, which currently ferries cargo to the orbiting laboratory. To stabilize the spacecraft, two drogue parachutes were deployed at 28,000 feet (8.5 km), according to the statement. The craft's pilot parachutes and main parachutes were subsequently deployed, before the heat shield (meant to protect the craft as it falls from space through Earth's atmosphere) was jettisoned at 4,500 feet (1,370 meters). Then, Starliner touched down "gently" in the desert sand. "This parachute test, as well as the subsequent tests in Boeing's qualification test campaign, provides valuable data, because the test article has the same mass, outer mold line and center of gravity as the flight vehicle," said Mark Biesack, spacecraft systems lead for NASA's Commercial Crew Program, in the statement. "The high-fidelity data they receive from these tests will anchor predicted models of realistic parachute deployment." A view from the top hatch of Boeing's CST-100 Starliner boilerplate capsule after its parachutes deployed during a February 2017 test. For space station missions, Starliner will launch on an Atlas V rocket from Space Launch Complex 41 at Cape Canaveral Air Force Station in Florida. At the end of each mission, Starliner will deploy large air bags to soften the blow upon landing. Boeing expects to use each spacecraft up to 10 times, ideally landing on solid ground to preserve reusability. In case of emergency, though, the spacecraft can parachute into the ocean.